Rockstar on Monday posted details and screenshots from the upcoming Grand Theft Auto V special and collector’s edition. The update highlights a number of digital enhancements and accessories for all three of the game’s protagonists which are outlined below. For starters, gamers will always have access to a pair of special firearms from the local Ammu-Nation store: a .50 caliber pistol and a bullpup shotgun. There’s also a hammer on tap should you wish to inflict damage up close and personal. Michael, Franklin and Trevor will also enjoy a 20 percent discount at any of the shops around Los Santos and Blaine County, we’re told. Each character will further enjoy a free outfit and one additional article of clothing each as well as a tattoo. If you’ve been keeping up with the game as we inch closer to launch, you already know that each character will have their own special ability. Michael’s special ability allows him to slow down time during a gunfight, Franklin possesses a similar time-altering ability while driving and Trevor can snap and cause double damage to enemies while only taking half as much damage from enemies. With the special and collector’s edition, the special ability bar will regenerate 25 percent faster. Those with special pre-orders will also enjoy stunt plane trials, a series of five unique challenges that will see gamers zip through mountains, deserts, oceans and cities in a stunt plane. Finally, collector’s edition buyers will have access to an exclusive garage to store custom vehicles. It’ll come stocked with a CarbonRS sports bike and a 1930s style hotrod called the Hotknife. Also, in Grand Theft Auto Online, gamers will have access to a unique character creation system that uses a parent’s heritage to build a character. 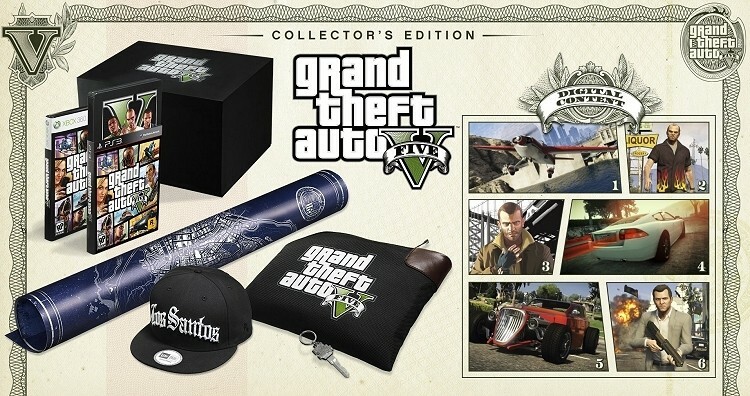 The collector’s edition package will include Niko Bellic, Claude and Misty from Grand Theft Auto III to use as parent options. Grand Theft Auto V will launch on Xbox 360 and PlayStation 3 on September 17. No word yet on when or if the title will be coming to PC or next generation consoles but we’re keeping our fingers crossed for both.